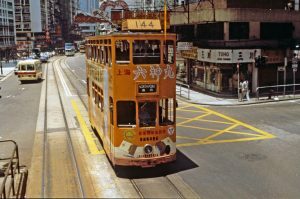 There are a total of 164 trams operating in Hong Kong, numbered 1 to 175, 62 of which are “Signature trams” (with aluminum bodies, alternating current motors and stops reporting). 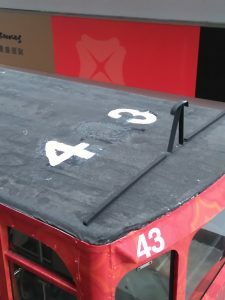 Over the decades there have been a few changes to the tram numbers, the reasons are varied and often difficult to trace. The earliest renumbering can be dated back to the post-war period. 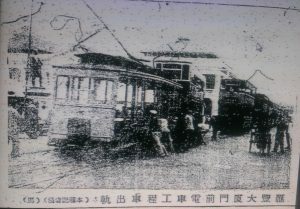 Trams became fully double decked in 1925, but single-deck works tram 150 had drawn attention in an off-track accident in 1950, and might be the only proof that single-deckers existed in post-war times. It was probably the former 15 of third-class and was renumbered to avoid the confusion with the double decker 15. On 10 March 1950, works car 150 jumped off the track when passing the scissors crossover near Statue Square, luckily there were no injuries, and eventually another tram assisted to move it back to the track. 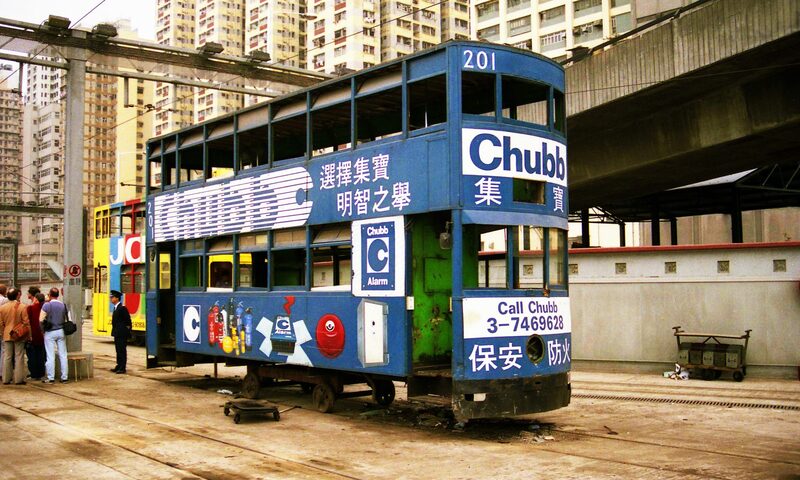 Tram 139 masqueraded as ‘Shanghai Tramways 22’ in the Shaw Brothers film “Shanghai Surprise” (上海驚奇), starring Madonna and Sean Penn. 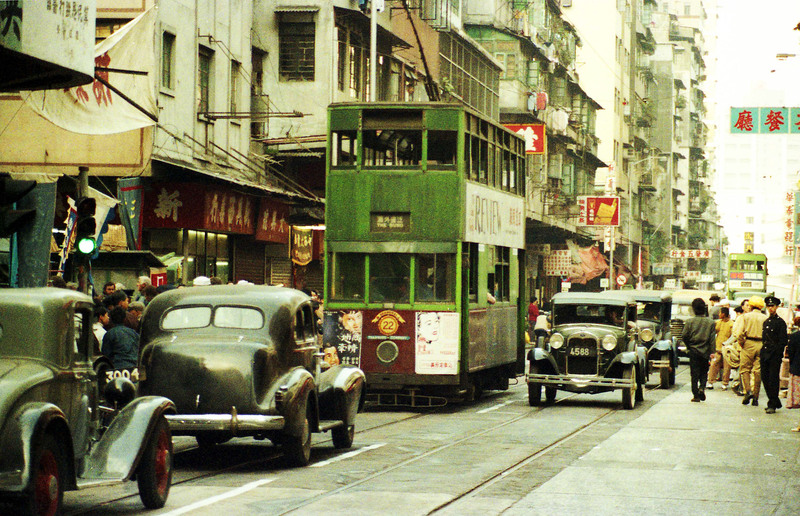 The filming took place on Catchick Street in the morning of 12 February 1986, being the fourth day in the Chinese Year of the Tiger, surrounded by hundreds of passers-by. 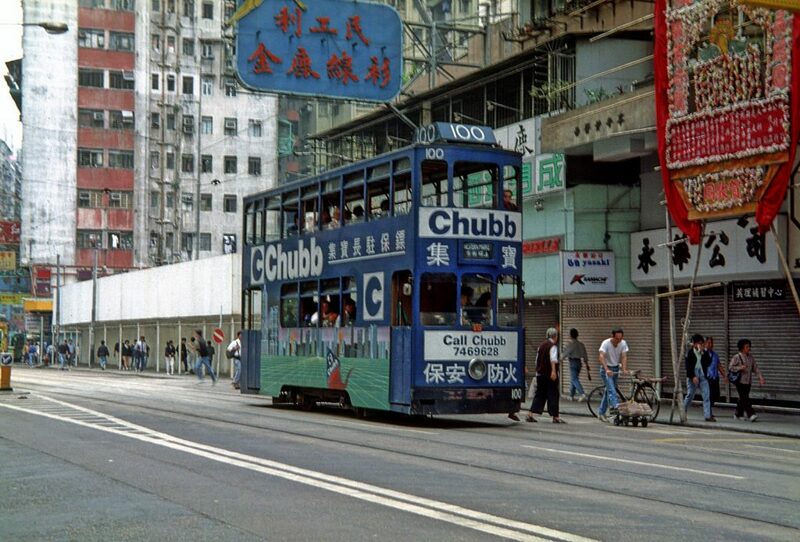 In September 1989 tram 100, pending for scrapping, was temporarily renumbered 201 and fitted with five 45 gallon water drums as a sprinkler car, maintaining its Chubb advertising with its gates removed. Car 201 was withdrawn at Whitty Street Depot the next year. Interestingly, the new car 100 entered service whilst 201 was still operating as a sprinkler car. 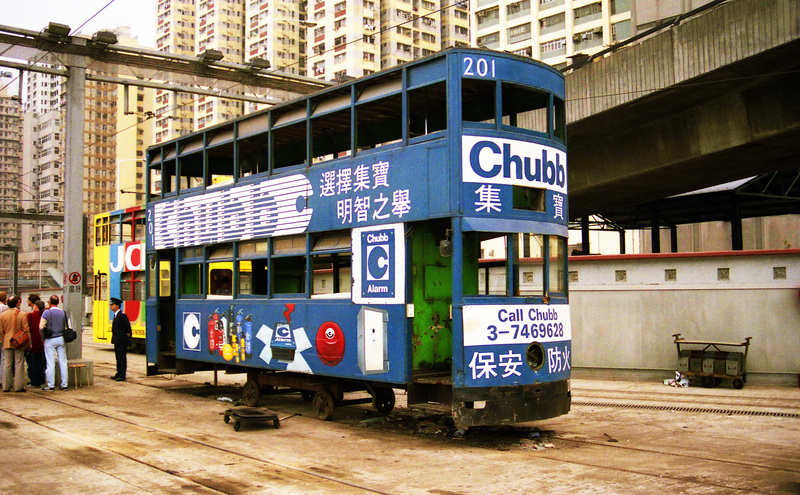 The new 100 also bore the overall blue Chubb livery. 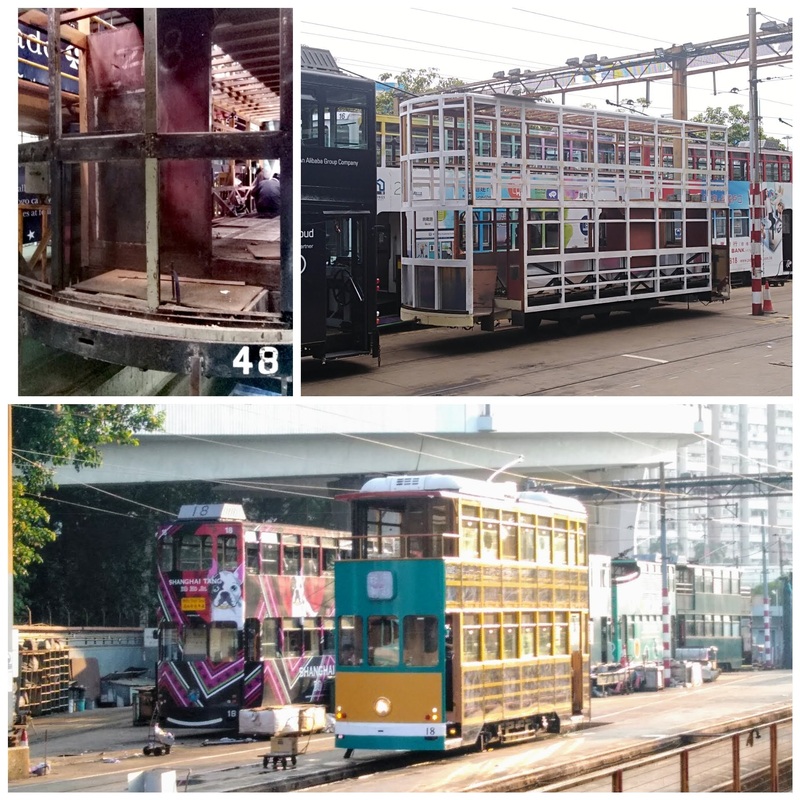 For filming purposes, three cars were renumbered 202, 203 and 204 in the early 1990s. Car 202 was renumbered from 56 (temporarily chalked on the fender), and was repainted in a 1950s style, with a small fleet number above the headlamp. However, it is not known which cars masqueraded as 203 and 204; neither is it known in which film (or TV programme) they appeared. In Chinese tradition the sound of ‘four’ (sei) in Cantonese, is almost a homophone with the word for ‘death’. 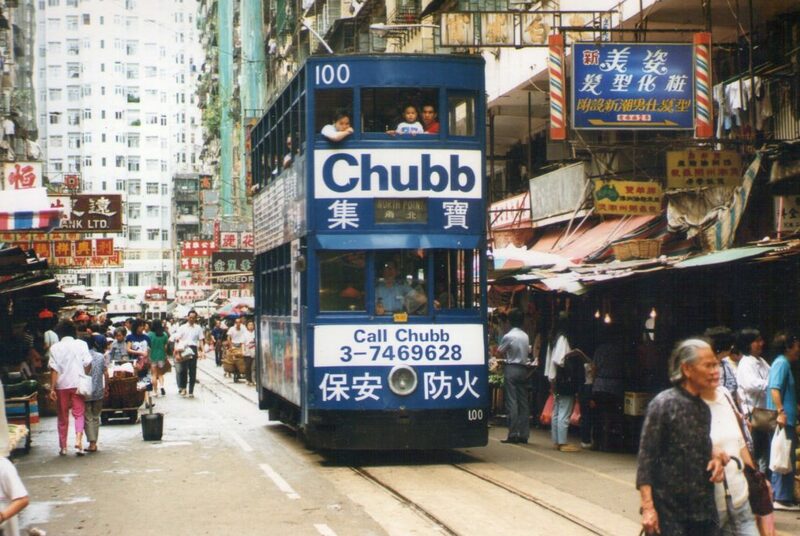 Apparently advertisers did not want such connotations upon trams where their products would be promoted. 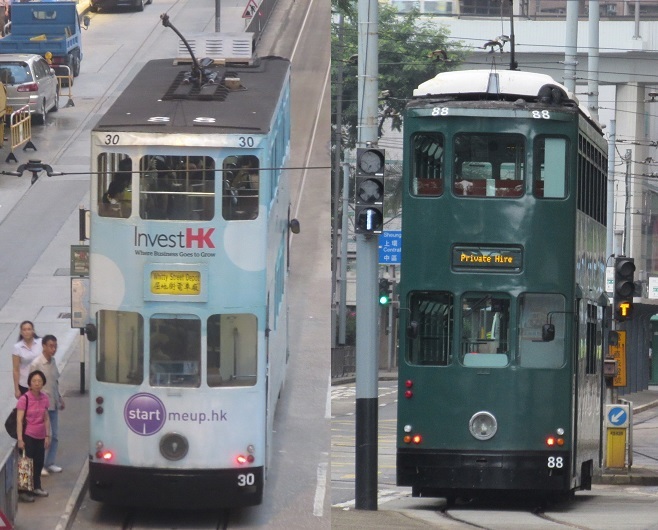 Hong Kong Tramways hence decided in 1992 and 1993 to renumber trams 44 and 144 to 165 and 166, respectively. 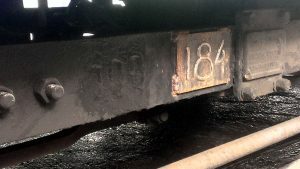 When 165 was pending scrapping in December 2016, a chalked ‘44’ was found at the bottom of the bulkhead, indicating its identity. There were never trams numbered 164 and 167, as ‘164’ sounds like “continuously die”. Some advertisers even dislike number 164 as it seems to echo the date of the 1989 massacre of Tiananmen Square on 4 June 1989. 167 sounds like “continuously jump-off the tracks”. Since about the year 2000 car numbers 63, 71, 85 and 134 have been missing. 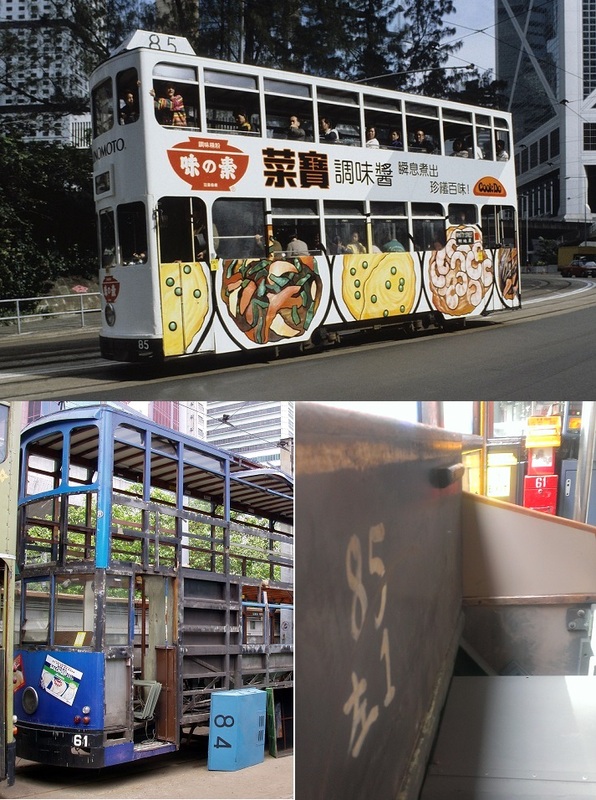 One possible explanation is that Hong Kong Tramways regarded these trams as ‘unlucky’ due to their accident records. 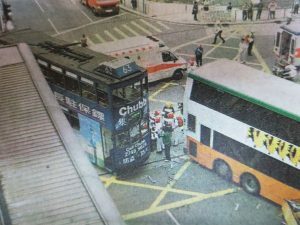 Car 63 jumped off the track and collided with a bus along Kennedy Town Praya, near Sai Cheong Street on 24 April 2001; 20 passengers were injured. 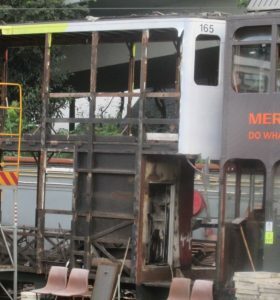 A fatal accident occurred with car 85 on 22 April 2002 and another fatal one at Whitty Street Depot in summer 2005, accelerated its “disappearance”. There are no details about the accidents involving 71 and 134, which apparently prompted their vacancies. Car 71 was scrapped in early 2002 and probably rebuilt as works car 300 in 2007, whilst 63 was renumbered as 5, car 85 was renumbered to 61 and 134 was renumbered 124. Hence, the original bodies of 5, 61 and 124 were scrapped. New numbers 171, 173, 174 and 175 seem to have replaced the aforementioned vacant numbers. 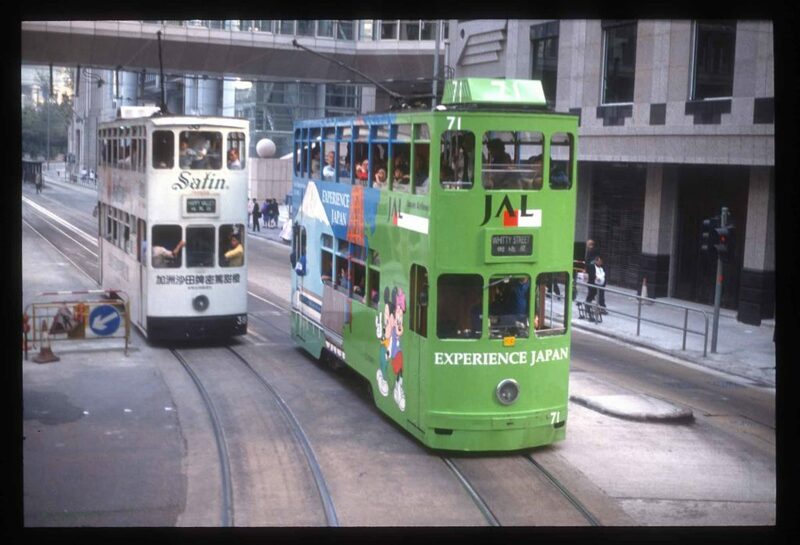 In June 1987 tram 12 was the first car to receive a new body and new underframe from local industry. This replaced the ‘post-war’ body built in 1952 that had gone to Vancouver in November 1985 for the Expo there. Meanwhile, tram 30 of 1988 had been used experimentally with full-height gates instead of the traditional half-height gates. 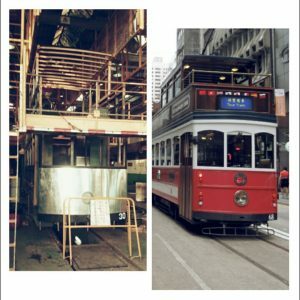 For some reason tram 30 was reported as ‘scrapped’ in 2002 and the vacancy has lasted for a few years. 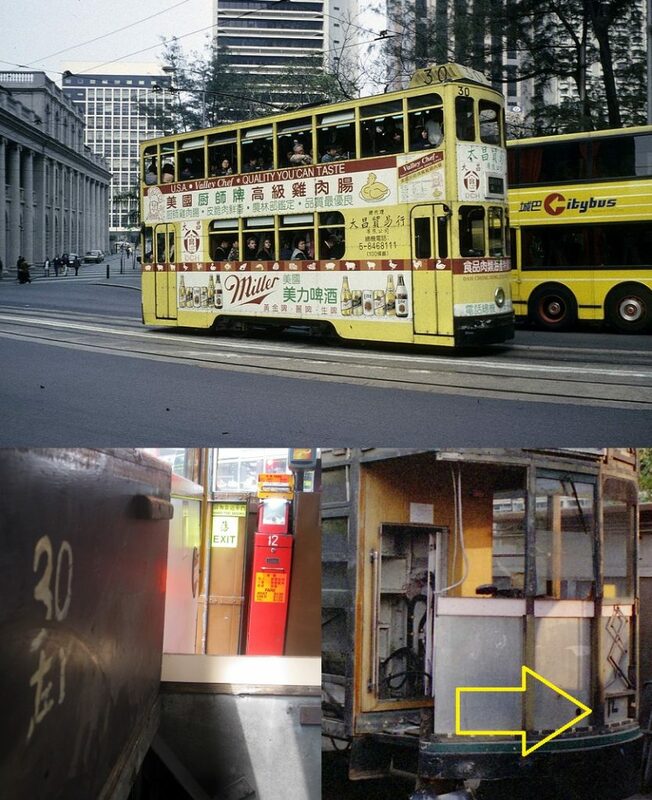 In fact, the original 1987-body of tram 12 was scrapped in 2002 (see the black written ’12’ on the right hand corner of the dash). 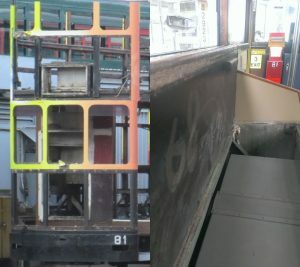 While tracing the identity of tram 12 a hidden ‘30’ was found under the bench, as well as a chalked ‘30’ on the bulkhead of 12 prior to its scrapping in 2016, indicating this should be the original 30. 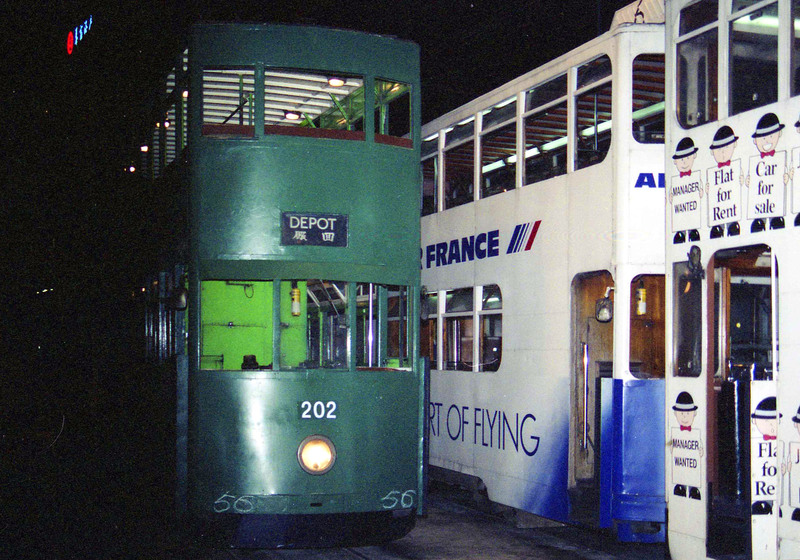 Around Millennium Year it was noticed that the body of 29 was discarded at Whitty Street Depot whilst a ‘new’ 29 had replaced it in public service from an unknown identity. 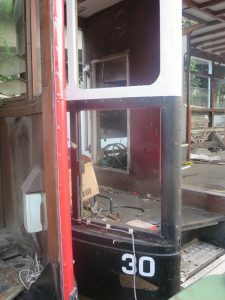 In October 2006 the discarded body of 29 was stripped down and rebuilt as the ‘new’ 30. In other words, ‘new’ 29, presently running, is possibly the former 888, a dummy car built in 1996 used for fire evacuation exercise. on the flat top of the roof at the rear end. The repaired 30 was later withdrawn, and from the bulkhead a chalked ‘29’ was found. 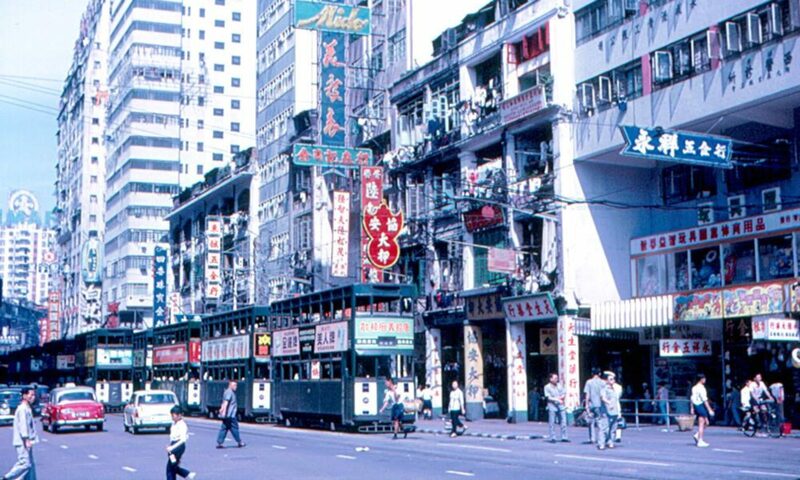 It was eventually rebuilt as tour tram 68. 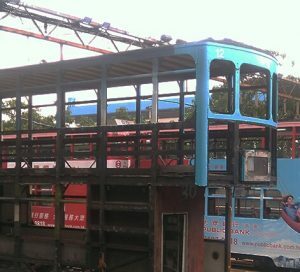 To make way for the tour car, former 68 renumbered to 81, in replacement of 81 that was scrapped in November 2015. A new air-conditioned 88 with hopper vents was built in the summer of 2014 and put into formal service on 6 June 2016, and probably replaced the former 171 of 2002, the prototype air-conditioned tram having full enclosed windows. The air-conditioner added 505kg to car 88, compared to 836kg for the prototype. Here are some exceptions to the renumbering that are not related to tram accidents. In 2015 new tram 43 was rebuilt in line with tram 15 ending an adverts promotion. Tram 15 was discarded and the former 43 renumbered to 15. 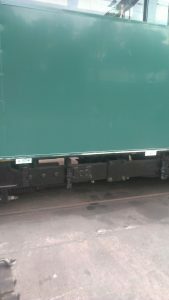 In addition, to make way for a new truck set no. 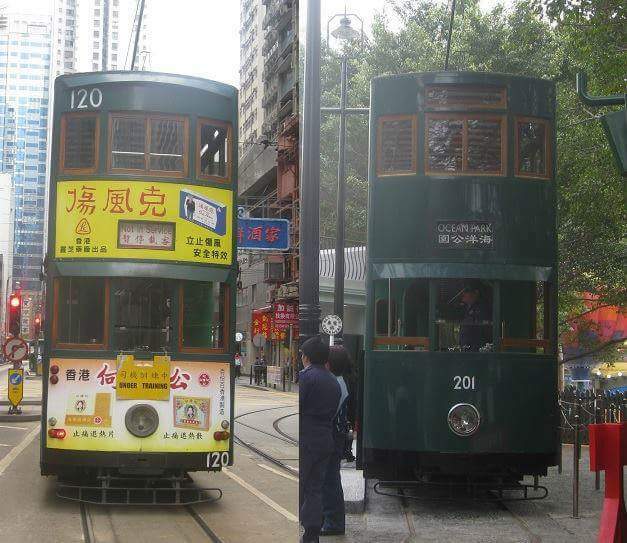 100, the original truck 100 was renumbered ‘184’ and the new tram 43 was soon renumbered to 100, thus former tram 100 was renumbered to tram 43. At the rear end of the roof the marked ‘100’ you still can see beneath the new painted ‘43’. 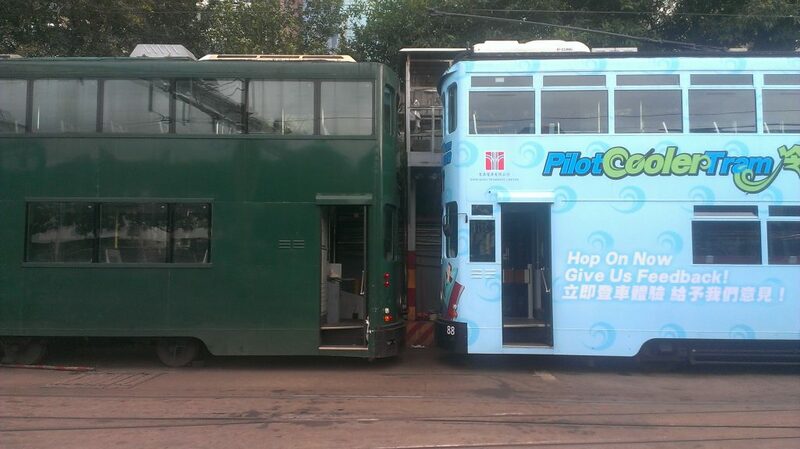 New Signature trams are without fleet numbers on the roof. Afterwards, a new 106 in place of the one scrapped, was in fact renumbered from former new 101 built in 2013. As the renumbered trams occurred without notice and mostly from personal observations, it becomes difficult to trace since last year. 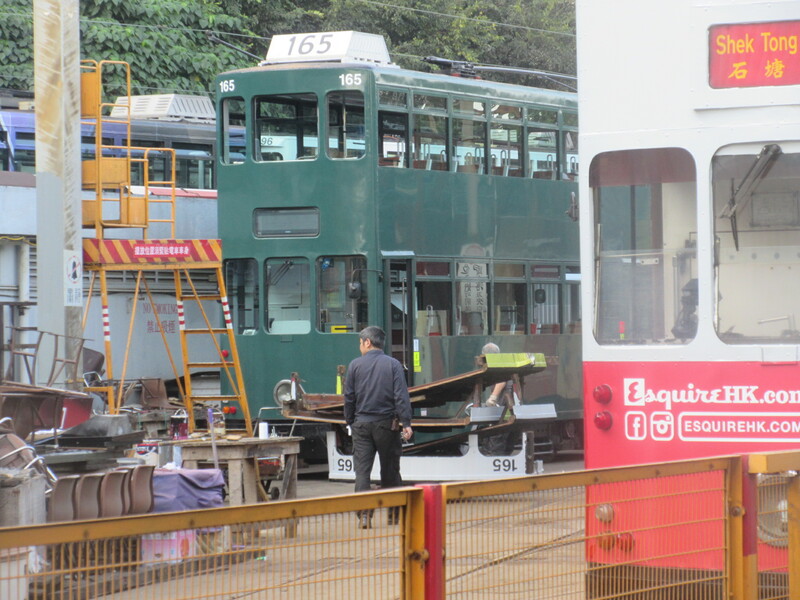 Tram 48, the only tram re-panelled in 2010, is discarded and a ‘new’ 48, renumbered from 21, resumed service in September 2017. 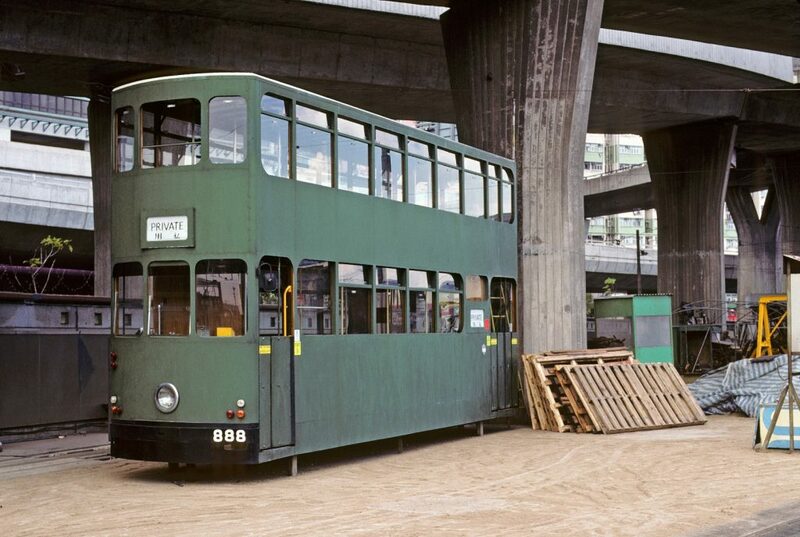 The former re-panelled 48 was eventually rebuilt as Circus Tram 18, in place of the old 18 of 1988. As of 2018, trams 39 and 65 are temporarily not in service, 39 was scrapped in March 2017 and 65 in November 2018. We also learnt that 46 was swapped with 110. 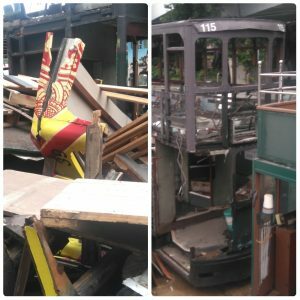 Trams with 1987-bodies commenced scrapping in 2011. 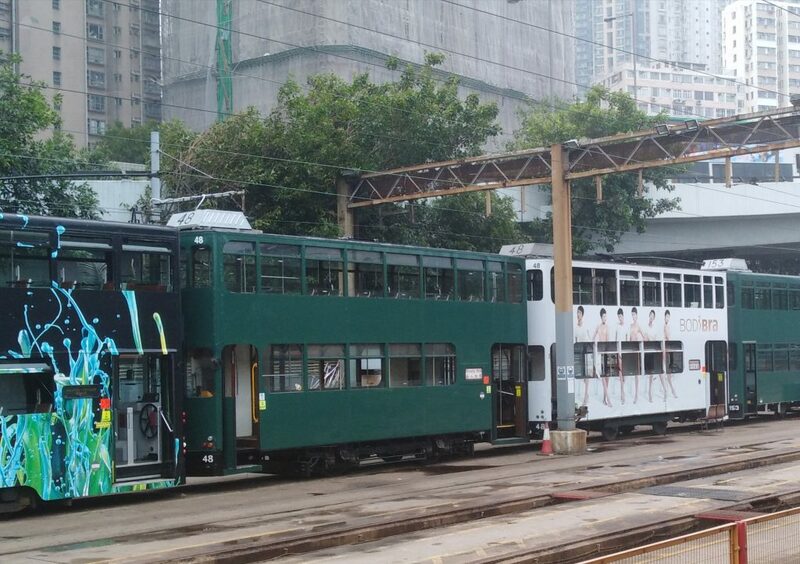 Tram 99 being the first one with parts being used in heritage car 201, currently displayed at the Ocean Park, which is painted dark green and features a 1950s style tram with two-classes and a single front staircase. 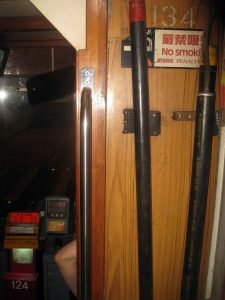 The updeck windows at both ends should be 4″ less deep at the bottom but follow the current 120, and the number was assigned to avoid the confusion with tram 120. Excellent work, Joseph, thank you. Fascinating information which would otherwise be impossible to know without your research. Thanks Paul! I hope this will be of interest.